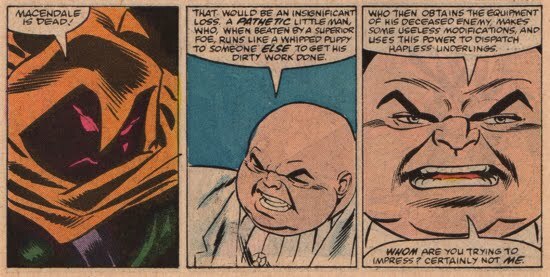 Well said Kingpin, my feelings exactly. That panel, by the way, is from Macendale's debut as the Hobgoblin in Amazing Spider-Man #289. To reiterate, the following is not a complete character summary of Jason Macendale, but rather an overview of the events involving Jason that directly affect (or were affected by) Norman Osborn. The panel below, from Web of Spider-Man #38, provides a poor-man's overview of Macendale's history. One inference you can pull from this panel is that Macendale must have been apprised of Norman Osborn's role as the original Green Goblin once he came in to possession of the "original Hobgoblin's criminal materials." This Jack O'Lantern turned Hobgoblin had a reasonably long run as the Hobgoblin until his arrest and eventual death. There's no need to cover all those details for this site (plus those stories were relatively forgettable), but one occurrence worth mentioning involved Macendale's attack on Harry Osborn as a means of obtaining Norman's Goblin Formula. After Ned Leeds was revealed to be the Hobgoblin (although it is later revealed that he was a brainwashed victim of Roderick Kingsley), Jason Macendale assumed the role of Hobgoblin. In Web of Spider-Man #47, the Hobgoblin attacked Harry Osborn and his family in an attempt to get his hands on Norman's Goblin Formula. Macendale recognized that he could not compete in the criminal enterprising world without a little bit of help. Harry was forced to lie to the Macendale, telling him "it" is at his offices in Manhattan. Harry initially had no idea what the Hobgoblin was referring to. But the attack triggered Harry's relapse into his Green Goblin persona as the memories came flooding back. Harry's diversion bought him some time, but he quickly donned the Goblin attire and went on the offensive. 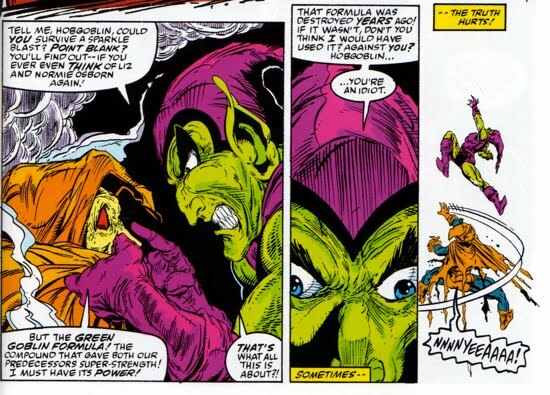 In Amazing Spider-Man #312, Spider-Man helped the Green Goblin in defeating the Hobgoblin. After Macendale's defeat he ended his search for the Goblin Formula. Macendale would eventually become possessed by a demon and that demon would eventually become the Demogoblin. Macendale would meet his ultimate demise from the original Hobgoblin, Roderick Kingsley, whilst in prison for his crimes as the Hobgoblin. This played out in Spider-Man: Hobgoblin Lives #1.